I am back with another look at some of the new products available from Stampin Up in their new Holiday Mini Catalog. If you missed my first review click here to check it out. This catalog is filled with stamps, papers, die cuts, kits and embellishments to help you create the perfect cards, party decor and gift wrapping for the upcoming holiday seasons. 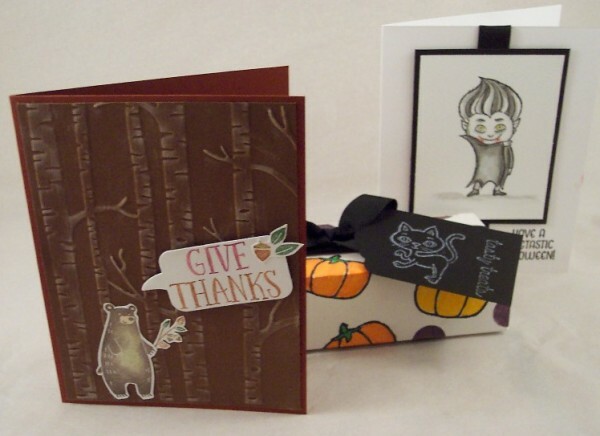 You’ll find woodland style stamps and papers perfect for Fall, fun and spooky images for Halloween and Christmas and Winter designs that are cute, elegant and retro. There are also many new collections of Designer Series Papers with matching embellishments like washi tapes, wooden shapes, paper clips and ribbons. Several projects kits match up with stamp sets to create gift tags and home decor projects. You’ll also find Thinlits Dies and Embossing folders that work perfectly with many different stamp sets too. 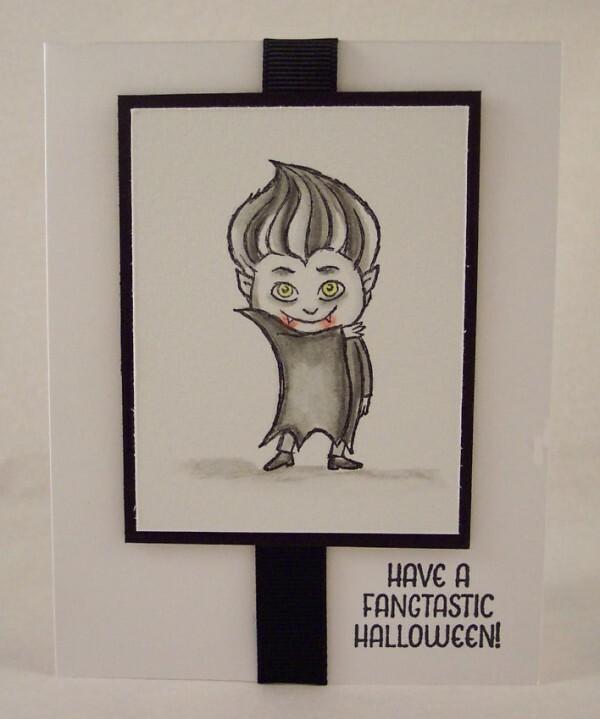 For this first project I used the vampire and a sentiment from the Haunt Ya’ Later stamp set. I kept all the coloring black and white to give him an old movie feel, except for the blood and his eyes, so that the red and yellow really pop out. I colored him using water color pencils. 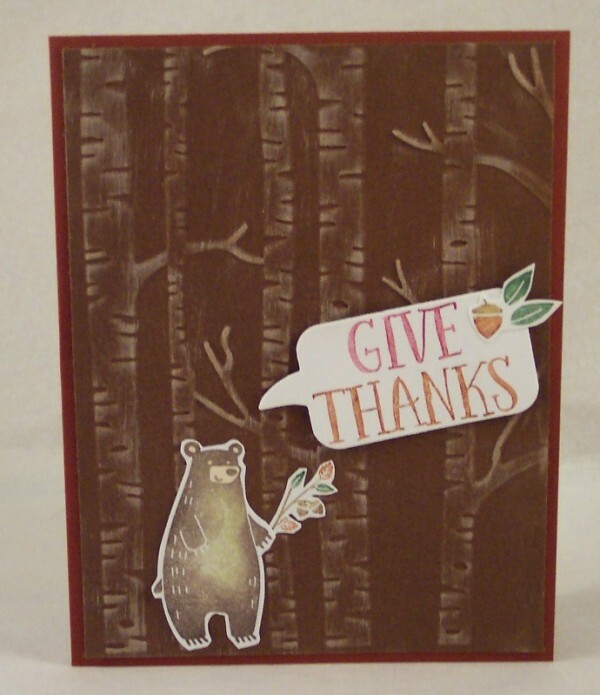 Next I used one of the adorable animals, the bear, from the Thankful Forest Friends stamp set. I inked the bear in a light tan and then rolled the edges of the stamp in a darker brown to give him some texture. The words, twig and acorns were colored with markers directly on the rubber. The background is the wonderful new Woodland Textured Impressions Embossing Folder. This large 6″x 6″ sized embossing folder is great for larger cards and scrapbook pages or can be trimmed down for cards. I used a brown cardstock and then wiped a white ink pad over the embossing to bring out some detail. The holiday mini has lots of ideas for gift packaging for the upcoming holidays and I was inspired to stamp up a candy box using the pumpkin from the Haunt Ya Later set, coloring it with markers and making a tag using white ink to stamp on black cardstock with the cat from the same stamp set and words from the All Boxed Up set, found in the regular Stampin’ Up catalog. You can view and purchase all these fantastic newStampin’ Up products today by visiting their website or contact your local Stampin’ Up demonstrator to place an order. If you don’t have a demostrator you can find one here. I’ll be back with a look at some winter and Christmas ideas soon, so be sure to check back!